Take a good look at the sketch of this man. Someone out there knows him. He is wanted for sexually assaulting a seven-year-old girl in Lemon Grove. It happened on Thursday, October 18th around 2:00 a.m. in the 7000 block of Canton Drive. A family member discovered the man inside the home and confronted him. Despite efforts to restrain him, the intruder was able to escape. 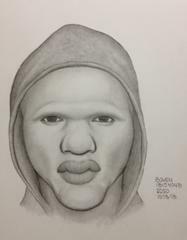 The witness describes the intruder as a black man between 20 and 25 years old, about 5'7" tall with a thin build. He was last seen wearing a black hoodie and black gym pants. Anyone with information on the identification and/or location of this suspect should call the Crime Stoppers anonymous tip line at (888) 580-8477. Crime Stoppers is offering up to a $1,000 reward to anyone with information that leads to an arrest in this case. 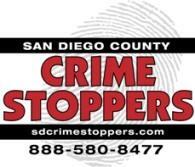 Visit the Crime Stoppers website at www.sdcrimestoppers.org for more information on how to send anonymous web and mobile app tips.